Thread: Satan Claus is Coming to Town!! Alrighty kids, stupid christmas is coming and I'm sure many of you are needing something to better your system/life. I'm not celebrating it, but that doesn't mean you guys can't. Give me your sad story about something you really want or need to make your computer or life better. Your video card might be too pathetic to handle Black Ops, so you can whine about how you really need a new video card. Or maybe you need a better camera to take pics of yourself in front of the mirror for your Facebook page, I don't really care. Legal: The winner, chosen by me will win a $100 (U.S. funds) gift card to Newegg to put towards that item you so desire. Everyone is eligible, staff included, since it's my contest and not tied directly to Mod-INC. Anyone in the world can participate too. If you are the winner and live in a region that Newegg will not ship to, then let me know. I can use my $100 U.S. to buy a gift card code at an online retailer (of your choosing) that will ship to you. Contest ends on December 15th[/b] at Midnight US Central time. This is really awesome for you to do this! I know there are some people that could use this, so bring on the stories. Greetings, not many people put up a contest on their own like this, +1 for making me register here =p! building a system piece by piece on a limited budget is slow, a copy of windows 7 or a large hard drive, so hard to decide what to get first for my next step, a fresh start on a new hard drive. My memory won't let me hit 4GHz on my Q6600!!! I need higher performance memory so I can join the 4GHz club! 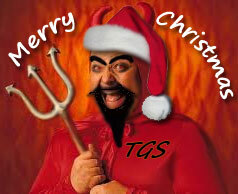 HELP ME SATAN CLAUS!!! And my keyboard is SOOOOOO dark! I need a sick new backlit keyboard for FPS PWNAGGGGGEEE!!! Wooooo, come here from the bit-tech forum. Okay... sad story. Here's a sad story for you. I seem to have the worst luck with power supplies. My rig has managed to kill 4 thus far. I have sourced some replacement parts from a friend who is kindly loaning them to me until I can pay him back, but I still lack a power supply. A friend recently attempted to purchase one from another member of a forum for me, and said member vanished with his money, no power supply sent along. I'm so low on money this time of year, that I can't put any cash towards a fresh computer part for myself. So, in summary. I'm too poor to buy a new power supply for this cursed rig, and now that I have new parts, any money for myself will obviously go towards paying my friend for his gear, and I still won't have a functional rig to game on, or record my music on. So please, I beg of you, o mighty Satan Claws. (cwhutididthar?) Hear my plea. Allow me to game once again! P.S. Clearly being Satan, you should show favour to a metalhead! Eh? Eh? Metalhead.......? Actually, you'd be surprised to know that I usually prefer Opera. Yep, you heard it here! Yes, I want you to beg dammit!! Oh god pleaaaaaase! I don't want to die! All I want to do is record music, frag n00bs and fall asleep to the sweet sweet symphony of case fans and blue lights. I beg of thee, oh might Satan Claus, that you might find it in your blackened, opera-loving heart to spare your demonesque love upon a gamer using an IBM Thinkpad Pentium III with 128MB of RAM, 8MB S3 Graphics, and a 20GB IDE HDD, all running a stripped out MicroXP just to be able to do anything! Please for the love of all that is unholy and foul and gory, rain your fiery blessings upon mineself! Don't believe me about the Thinkpad? 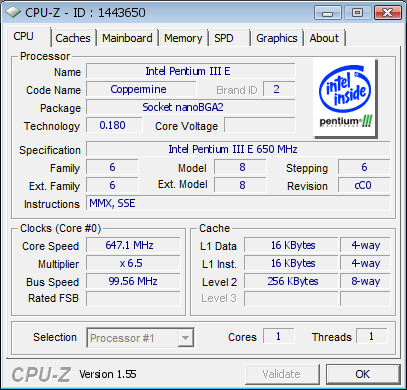 See the CPU-Z validation. Here's the image, for the lazy. I've got my NES computer hooked up to my TV, and it's great for NES games, but I really need a little something for watching HD content, and it just isn't powerful enough. $100 would offset the costs of a HTPC build enough that my wife would let me go ahead and build something. I've gravitated over here from another forum (rhymes with sit-tech) to share a tale of woe. My rig is spot-on, absolutely perfect for me. I have no complaints with my computer, and aside from a lack of gainful employment (which, given a bit of luck, should be rectified this Thursday), everything's OK for me. Except I don't have anyone to game with. Y'see, my mate's power supply went the way of the dodo the other month. As luck would have it, he was going for an extensive interview/test-day at a major PC publication, and they gave him a PSU on the house, so to speak. He was chuffed, and there was much rejoicing! So, I dutifully head down to the bank, hand over my 24 Great British Pounds (and they are great - they let me buy stuff! ), send a message to the owner of the PSU, let him know I've paid him, and my mate sends on his address. Well, it's a while later, and we're no closer to getting that PSU. Which means my friend's still on the Thinkpad (no games, no talking, no music), AND I'm worse-off for my charitable deed. To top it all off, I don't like playing with strangers online (half of the time, they're FBI agents trying to deprive me of swee- Erm, hang on... ahem...), so it's more or less rendered my multiplayer games on Steam useless - I even bought this friend a copy of Serious Sam for co-op! So, I'm lonely, out of pocket, and stuck on singleplayer games this Christmas. Satan, don't let it be so! Oh yeah, and I'll be buying sleepy a PSU with some of the winnings. Spirit of the season, and all that. So you're wanting to put the money towards a new lappy or what?